Safety harnesses are webbing assemblies that physically connect you to the boat to prevent you from falling overboard or, failing in that role, are intended to keep you from being separated from the boat. 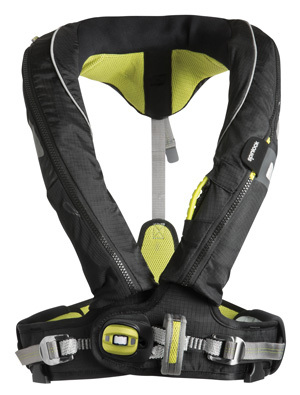 Harnesses are either stand-alone items or are integrated with offshore type inflatable life vests. Tethers clip you to a fixed-location padeye or to jacklines (also called trolley lines or jack stays) that are lengths of rope, webbing or wire running fore and aft or athwartships. Jacklines can be run on the boat’s centerline, along each side deck or secured inside the cockpit. For years, customers bought foam life jackets, safety harnesses, and tethers when they equipped their boats to go offshore. This has changed dramatically with the introduction of the combination safety harness and inflatable life jacket. In virtually all conditions where you would elect to wear a safety harness, you would also elect to wear a life jacket, and vice versa; so in our opinion, the buying of separate items is not warranted. There’s another reason to wear harnesses integrated with inflatables—it’s very difficult to find a combination of separate life jackets and harnesses that don’t interfere with one another. And it’s time consuming to preparing to come on deck when you have to juggle such things as foul weather gear, gloves, a hat and a life jacket. We prefer the simplicity of putting on one piece of safety gear with all of the components built-in. Snap Shackle: Easy to release under load, but can be released accidentally if the lanyard is pulled. Best for the harness end of the tether. Snap Hook: Easy to attach, difficult to detach under load. Although designed to reduce accidental release from padeyes and deck attachments, accidental releases can sometimes occur. 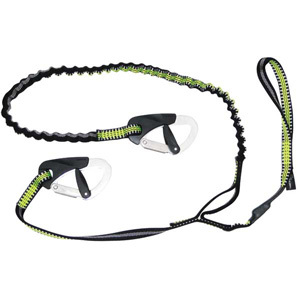 Double-Action Safety Hook: Easy to attach and detach. Lightweight aluminum hook locks closed automatically and will not come undone accidentally. Easy to release with one ergonomic hand movement. 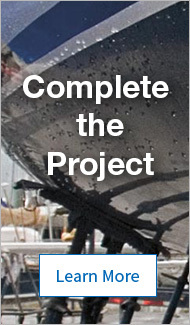 The International Sailing Federation (ISAF) includes the following warning in Section 5.02 of their 2016–2017 Offshore Special Regulations for sailboat racing: “Warning: it is possible for a plain snaphook to disengage from a U-bolt if the hook is rotated under load at right-angles to the axis of the U-bolt. For this reason the use of snaphooks with positive locking devices is strongly recommended.” Our ISAF-Specification Tethers meet these requirements with snaphooks that cannot accidentally release, but are simple to manually disengage. Jacklines should be as strong as the safety harness since the strain on them is greater. They are commonly made from nylon webbing treated to resist UV degradation, but nylon stretches too much, allowing too much range of motion when crewmembers are clipped to it. Therefore, we recommend either using low-stretch braid like V-12 or Amsteel, or polyester webbing jacklines from West Marine (which are easier on your feet than stepping on round line, and won’t roll under your feet and knock you off balance). Any of those alternatives will dramatically reduce the distance that the jacklines can be pulled off-center, which can contribute to keeping your crew on deck where they belong. I sail in coastal and offshore races regularly on my Cal 40 and an Antrim 27 sportboat, and our jacklines are polyester webbing. Because this stuff is stretchy, we run a purchase system of AmSteel Dyneema loops and cinch the after end up tight. This system has worked well for keeping my crew onboard. Spinlock Deckware Double Safety Tether attached to your harness with a sewn loop via a cow hitch. It is the lightest and most comfortable tether, but you need a knife to cut it loose. Spinlock Automatic Inflatable Deckvest with Harness is light and comfortable to wear if you’re offshore. Includes leg straps. Double tethers, with one 6' tether and one 3' tether, are the best way to solve this problem. You can use the long tether when you’re moving about the boat and hooked onto a jackline. Clip on with the shorter tether if you’re working on the bow or other stationary location. I stuff the unused tether in the front pocket of my foul weather bibs, so it won’t accidentally hook onto a shroud or other object. Two double tether choices are available. The West Marine ISAF-Specification Double Safety Tether clips onto your safety harness with a snap shackle. If you need to unclip in a hurry (as might happen when your boat suddenly turtles after losing its keel) you just need to grab the lanyard and open the shackle. The Spinlock Deckware Safety Tether is lighter and less clunky then the West Marine product, but it attaches to your harness using a cow hitch (like a luggage tag loop). If you need to disengage it from your body, you have to cut the tether away. It you have a rigging knife on your person (as the Offshore Special Regs require), and if, in a moment where you’re likely to panic, you remember it, you can cut yourself free. Spinlock’s Automatic Inflatable Deckvest with Harness, the companion life vest designed to work with their double tether, includes an Emergency Safety Line Cutter in a pocket of the vest. This PFD is confortable and ergonomic. I wear it, but use the West Marine Double Tether so I can release it in an emergency.